Laughing doves (Streptopelia senegalensis) are probably the most common birds in the garden, so it is about time that they made their way first onto my list this month. I often think of them as being the bravest of doves. This is because they are the first to cautiously approach the feeding area once the seed has been put out. They start by gathering in the tall jacaranda tree on the pavement and then gradually work their way, in ones and twos, through the trees towards the food source. At last, one will flutter down to peck at the seeds scattered on the lawn … then there are two … then more arrive in a flurry of ‘petticoats’ until there is a moving blanket of them. Only then are they joined by the much larger Redeyed doves, Rock pigeons and, occasionally, Cape turtle doves. Their heads bob rhythmically as they peck at the seeds and move on. Laughing doves seem to spend a lot of time courting each other. On sunny days they also enjoy finding an open, dusty spot for dust baths before nestling as flat as possible with their wings spread out. A pair of House sparrows have been making their appearance this month, along with a rather tatty looking Red bishop, not yet showing his full sartorial splendour. The Redchested cuckoo (Piet-my-vrou) has returned; more easily heard (often from 3 a.m. onwards!) than seen. Burchell’s coucals fall into the same category. Having heard them for several days, it was good to actually see a pair of African green pigeons flit about the fig tree. The latter has been shedding leaves for some time and is now beginning to put out beautifully shiny ones. It is with the return of the Diederik cuckoo that I feel our spring is complete. 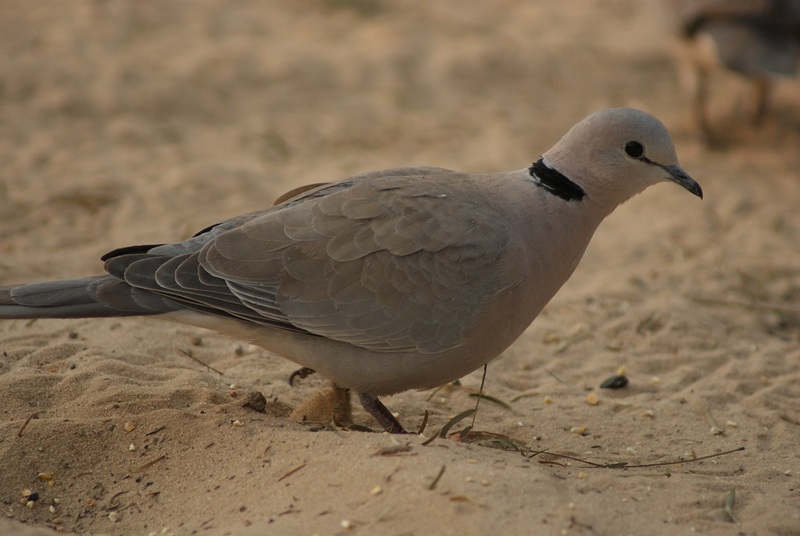 This entry was posted in Birds, Garden and tagged bird list, Laughing Dove, trees. Bookmark the permalink.